Assassin's Creed III isn't supposed to be out until tomorrow, but you know what? There are more important things in life than honouring street dates when your town is about to be swallowed up by water. 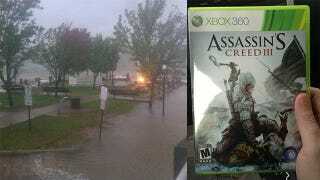 Reader Andrew says his local game store in New Jersey, knowing they wouldn't be open until at least Wednesday because of Hurricane Sandy closures, figured "screw it" and sold the copies of Assassin's Creed III they had so that people bunkering down could at least bunker down with one of the biggest games of the year. Stay safe, Andrew! And if you're safe, enjoy!